Another film SLR revival project pops up. It will feature the usual progression of shutter speeds, from 1/2 to 1/500 and bulb, and take Nikon-F lenses. It's completely unmetered, so... Sunny 16 or external meter, but that low maximum shutter speed is going to demand slow film in bright light. On the upside, it does come with a flash hotshoe. Body-only starts at US$529.00; more expensive pledges come with a Meyer-Optik lens of various descriptions; see the second link. 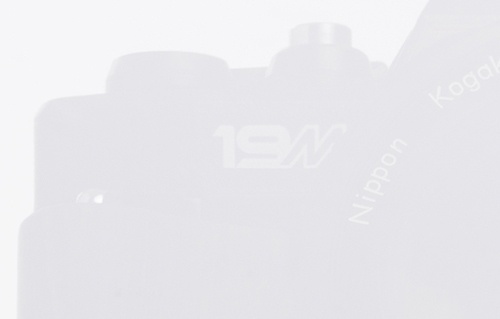 Sort of disappointed it's not in K mount, but they had to choose something and Nikon isn't a bad pick. After the kickstarter closes, it's on a made to order basis, and the price will be $1500 body only. That is the point at which it will die. I agree. I don't see the appeal off the top of my head. I can buy a Nikon F3, Pentax KX, Olympus OM2n, Nikon FE2 and a bunch of descent glass, all locally for that much cash. What are they thinking? New circuit boards would be a still better idea, but we're asking for the moon there. I can see someone paying the Kickstarter price for one of these; it is after all a new-build, all-mechanical SLR with no electronics to go wrong, and if they do it anywhere near right (and the engineering team seems to have a history of knowing what they're doing) it will still be kicking when those Reflex cameras have all gone to the electronic graveyard. But US$1500 is insane. By the time that price comes into effect, you'll easily be finding used K-1's selling for that. My guess is that the market at post-Kickstarter prices will be foolish, unthinking people who want a new-build film camera, can't stretch to a film Leica, and don't want a Voigtlander Bessa for some reason. I'm not seeing any other new-build SLR film cameras in the latest B&H catalogue, so I suspect the previous competition has left the market and the new-film-body field is clear for the Kickstarter wallet-rapists to close in on the hapless hipsters. (I am not saying they will make a bad product, just that for what you're getting, you could have it used at a tenth of the price; I'm pretty sure that if you got lucky on E-bay or at a garage sale, and the postage was in your favour, you could have an S1a with a 55/2.0 in hand and CLA'd by Eric for under $150). 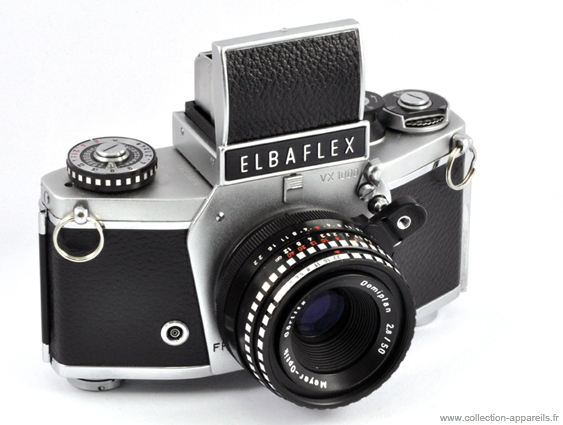 Why the Elbaflex (aka Exakta VX1000)? I own one. It is quirky cool, but I can think of dozens of other cameras that I would rather see revived. 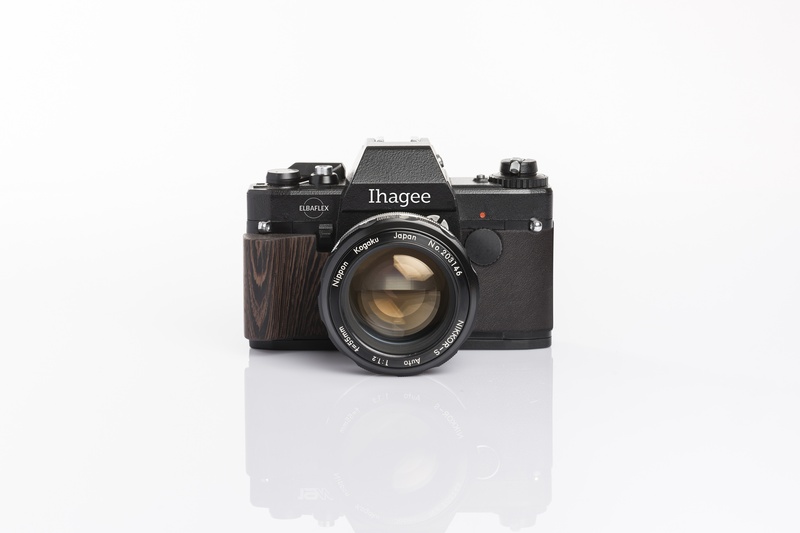 I would also note that F-mount is not a revival, the camera hardly appears to be even remotely similar to the Elbaflex and Ihagee has not been a functional manufacturer since the late 1960s. From what I can tell, this is a tie-in with the revival of the Meyer-Optik brand name. The camera itself has an eerie resemblance (both physical and features) to the 1985 Kiev-19 F-mount SLR made by Arsenal in Ukraine. Yes, the new Elbaflex has a much older twin. 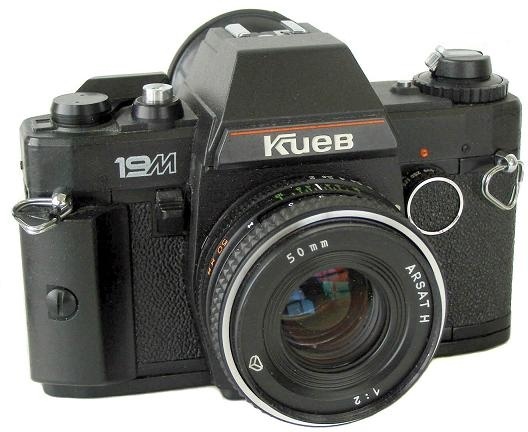 The Kiev-19 had a built-in meter and 1/1000s top speed, however. $529 for a 32 year-old Ukrainian design? I think I would sooner spring $150 on eBay (Helios 81H included) unless I was truly enamored of the bumpy black paint. Last edited by stevebrot; 11-21-2017 at 09:18 AM. You can argue forever about which mount they should have picked. 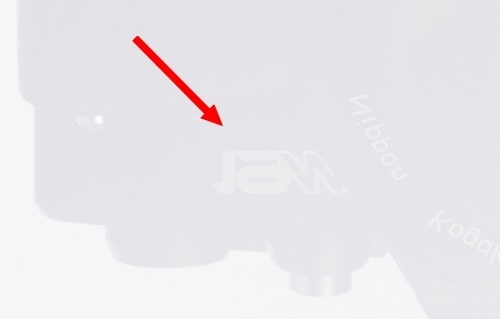 One can make a case for both M42 (how many gazillion lenses out there?) or K, but we are biased here with regard to both. Nevertheless, I find myself being unable to object to their choice of a bayonet mount, and in that case it really does come down to K or F. The K mount is probably the more universal in some ways (Pentax, Ricoh, Chinon, Sears*, for those with dead cameras and live lenses they want to revive), but the F mount is significantly older (1959 vs 1975) with probably a larger number and variety of lenses out there able to be mounted, and nothing to be lost by either AI, pre-AI or whatever; just so long as you have that aperture ring, you're good. As stated before by stevebrot, this so-called Ihagee Elbaflex is indeed a revamped Kiev 19M camera (designed and manufactured from 1988 onwards at the Arsenal factory, Kiev, Ukraine, then part of the Soviet Union) without its light meter and with a wooden grip replacing the original plastic one. The people behind the Ihagee Elbaflex project are the German, listed, Koblenz-headquartered net SE group. net SE are also behind the resurrection of Meyer-Optik Görlitz (several lenses), Oprema Jena (two Biotar lenses), Emil Busch A.-G. Rathenau (Glaukar Anastigmat lens) and C.P. Goerz (Citograph 35, a 35mm f/8 fixed-focal lens). Most trademarks belong to their subsidiary SEMI Verwaltung GmbH, also headquartered in Koblenz: C.P. Goerz, Ihagee, Meyer Optik, Biotar, Lydith, Makroplasmat, Nocturnus, Oreston, Primagon, Telemegor and probably more. Some trademarks belong to net SE directly: Emil Busch A.-G. Rathenau, Glaukar and Anastigmat. Do you want to laugh a bit? I would presume so. ...but they forgot to photoshop the '19M' (from Kiev 19M) out of the reflection!!! Personally if I were building a new film camera I would contact the guys who made the Adaptist mount for the Pentax cameras and license their mount. You would then set the mount distance to the Pentax standard to allow you to use a variety of old vintage lenses. That might be worth the money over an older body for some people. But most would just refurb a couple of older bodies and not worry about electronics that they might not care about - just get a sufficiently mechanical body and grab a few spares for parts. this so-called Ihagee Elbaflex is indeed a revamped Kiev 19M camera (designed and manufactured from 1988 onwards at the Arsenal factory, Kiev, Ukraine, then part of the Soviet Union) without its light meter and with a wooden grip replacing the original plastic one. After comparing the two, I'm beginning to wonder if this is in fact leftover 19m stock with leather and whatnot stuck on. I saw your comments on their project page along with the all-too-obvious fake glowing notes of support. In my opinion the net SE group are a bunch of shysters seeking to capitalize on significant old names in the interest of selling product of dubious performance and pedigree. Their Biotar is so in name only and the same is true for their other revival lenses. A true updated version of the Exakta system camera would likely create a cult following similar to that of the Cosina-made Bessaflex TM. The relabeled Kiev will likely result in resentment once the backers realize they have been had. BTW, I noticed that they have restricted comments on the KS project page to backers only. Oh btw, does anyone know if that cheap Kmount Vivitar SLR is still available? How about we change its production to have a little better materials, slap on some fake leather, and sell it at 20x markup? Add a PentaxForums logo on it and I'm interested! Oh deary me, what a fuss there will be if it ever gets to the point of people paying $1500 for something they could probably scrounge out of a bargain bin or yard sale for $15! !